Marta is going to meet the Queen of Spain. A little while ago, Marta won a scholarship awarded by a Catalonian bank, which allowed her the opportunity to study a postgraduate course in the good old US of A. Now, with the application process over (and two acceptances so far! ), the bank are holding a ceremony to formally present the scholarships, and the Queen of Spain is going to be there. As Marta’s official dressmaker, it has fallen to me to make her outfit, and it is now approaching completion. 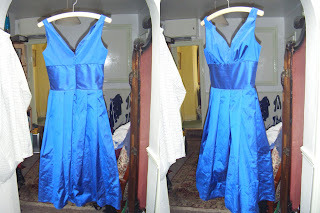 We decided to go for an appropriately royal blue silk cocktail dress, with a black silk bolero, and a matching clutch. This is a really awful picture of the dress on a hanger; because Marta is so small, and she really is very small, I cannot get the underbust on Esmerelda (my mannequin) sufficiently small, even though she is a small herself. Bizarre. The dress is made from a lovely silk taffeta, and is going to be worn with an organza petticoat to give it a little extra body, with these shoes from Irregular Choice, and with these stockings from Wolford. All in all, a very regal showing. This entry was posted on Wednesday, February 24th, 2010 at 12:59 pm	and is filed under sewing. You can follow any responses to this entry through the RSS 2.0 feed. You can leave a response, or trackback from your own site.